My social life has taken a battering. No surprise there. But when an invite appeared for a big 4-0 knees up, I could hardly pass it up. There I was in my new 70s wooden platforms. Drinking Pimms on a boat. Dancing to Electronica. Smiling as I waited for a taxi in biting wind. Thrilled as I leapt into bed well past midnight. And then the kids woke up at 5:30am. The man and I valiantly took it in turns to nurse sore heads and play doting parents. As I lay starving stretched out on the once-pale cream rug being prodded with lego pieces, I remembered the glimmer of hope in the fridge. Introducing my new secret weapon: K ji. Nanny extraordinaire. Superlative cook. This is the roti-making, cumin seed/mustard seed loving soul I have been waiting for my whole life. (The kids love her too) On Friday, I trialled her very own Capsicum Bhaji recipe - spicy bell peppers sauteed with gram flour, with just a hint of sweet and sour. It took 20 minutes to make. She expertly rolled the rotis and together we stashed the results into the fridge. The keyword here being result! I slowly felt life return as I shoved warm rotis stuffed with K ji's special into my parched mouth. A much needed lie-in or two and I'll be ready for another big night. Maybe. PS = Bheja means brain, and Bhaji means fry. Thank you Sandeepa, for inspiring this post's title! Slice the peppers and onions into cubes and set aside. In a non stick pan, dry roast the gram flour for about five minutes. In another non stick pan, bring the oil to heat on high. When it’s hot, add the asafoetida and seeds. As they sizzle up, add the onions, peppers and chilli powder. Now stir the whole lot, mixing the spices and cookign the onions and peppers. When theyÂ have softened, mix in the roasted gram flour, the lemon juice, sugar and salt. A teaspoon of salt should do the trick. Mix the whole lot together until the gram flour is golden throughout. 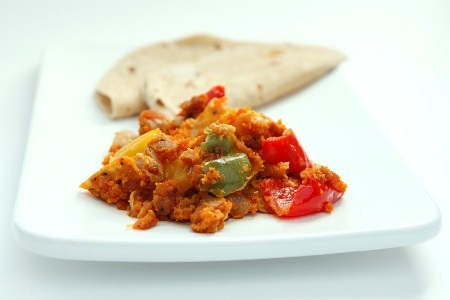 The spoon onto a plate and eat with warm rotis or toasted pitta bread. One last tip – this rocks even more the next day, so make extra and savour! I love this capsicum bhaji with besan, had made a version long back. Needs some oil but then what is life without it. Good to know you found your soul mate ;-), these are the ladies we all need. Mine has been there for almost 3 years now and going the route of “purana employee so will just relax” mode. Delish looks like one of the Italian antipasto dishes. How can one go wrong with salty, sweet, spicy and sour. Will try reproducing it at home. This looks delicious! I have cooked capsicum with besan but not with sugar! I love just a hint of sweetness in curries and sabjis 🙂 will make this for dinner tomorrow!! bheja. Thank god you shared the meaning in the end. Hi, I’m a HUGE fan of your book – it is such a straight-forward text and has really helped me to understand the basics of Indian cooking. I love it! As I have a friend going to India this summer I was hoping that they might be able to source a copy of the book you described as beloved by aunties and new wives for me – the N.I.A.W. cookbook – how can I get my hands on a copy? I made your rajma this week and am still dreaming of it! hi malika…i came across you book while browsing in WH smith the other day and loved it..i was out of time, so could only flip through it..but from what i saw it was amazing..
I’m glad to see you back in action… Just in time for summer! This looks delicious! My family loved it. Something different from the usual stuff. Traditional Indian food/cooking, the way it should be! Oh the flavours and combinations are fabulous !!! Looks delicious, I should try it for my partner. He will propose me! Tried it a couple of times… savior when I need quick meals! Hello There. I found your blog using msn. This is a very well written article. I will make sure to bookmark it and return to read more of your useful info. Thanks for the post. Iâ€™ll definitely return. Hi, I am really impressed by your blog, just happen to find it through google….liked the names given to each recipe, very creative..will surely try your bheja bhaji and follow your blog too!! Hi..very creative blog, too impressed by it…will surely try few of your recipes. this recipe is brilliant. i never expected my hubby to eat capsicum and bell peppers. but when i made this he really enjoyed eating the bell peppers. thank you. I saw Bheja Fry and was looking for a brain recipe. Hi Mallika! this is the first time i came across this web site….loved every word written by you…..honestly i think i am a gr8 cook…but your recipes are really coool….and the way you write is amazing! Now I know how to make this I cant wait to get home tonight and make this, Thank you so much for sharing this recipe for bheja bhaji. Oh my! This is to die for! Thank you! It looks so easy and yummy…. the name is also too unique used by you. Thanks for sharing and keep blogging. Nice unique recipe!!! Let me have my try at this week end!!! Hey,I am a new cook and came across ur blog post.When going through one section of ur blog ,i came across a part which says Dont use olive oil ,as it has a taste of its own and also sunflower oil fries the masalas in a proper way than olive way.I totally disagree with you. food.Extra light olive oil is olive oil which has been heavily refined, so that it has a pale color and minimal flavor. Since the oil has a lower smoking point than many other types of olive oil, it is suitable for high heat cooking and baking. The neutral flavor makes it a poor choice for dishes in which the taste of olive oil is desired, however. I started using olive oil recently due to high cholesterol levels ,and started to go through various blog posts But ur information was very misleading.Correct information on blogs can always help a reader.Anyways i like ur blog post.Thought of sharing this to you. Hi there, a new cook, sorry but I can’t stomach the thought of our rich, age old cuisine being stirred and served up in extra virgin olive oil. Maybe that’s just me! Happy cooking.